Having the creature comforts of home is one of the primary benefits of traveling in an RV. Although you’re enjoying life on the road, being able to use various appliances and electronics can ensure that your journey is even better. However, depending on the kind of traveling you’re doing, it may not always be feasible to plug into shore power whenever you need to operate the different machines inside your mobile home. For those instances, having a portable generator is a must. Today, we’re going to be looking at the best generators for travel trailers, although they can also be useful for other types of RVs as well, depending on your needs. When looking at the best generators, one of the most significant decisions you’ll have to make is the type of fuel you’ll be using. While you can use either gasoline or propane, I highly recommend the former because it generates more power and it’s easier to find. All of the generators on this list run on gas, and our first model from Champion is a high-quality unit that will make it easy to boondock wherever you are. If convenience is something important to you, then you’ll really appreciate this bonus feature that comes with this generator. Rather than having to go to the machine itself every time you want to turn it on or off, you can simply use the remote control feature. While I don’t recommend doing this all the time (as you have to monitor the fuel level and output on occasion), it’s a nice luxury to have when you’re looking for a quick and easy way to generate power. When comparing different generators, one of the most crucial elements will be the wattage output. You will have to convert watts into volts so that you can figure out how many appliances can run off of a single motor, but on average, you’ll want at least 2500 watts for a travel trailer. Another thing to pay attention to is the peak wattage versus continuous wattage. In this case, you can get up to 3100 watts when the generator is first starting, but it only operates at 2800 watts, so keep that in mind when determining your power needs. One thing that you may not realize if you’re still new to the world of generators is that they can produce fluctuating power. Unlike the electricity coming from your outlets at home, generators are not always capable of keeping a smooth current. Unfortunately, when these hiccups happen, they can damage sensitive electronics, like laptops or smartphones. Thankfully, this particular generator is designed to alleviate this problem so that you can use it for all kinds of electronics without any worry. Although this isn’t the most powerful generator on this list, it is one of the most convenient and reliable. I like the remote start, as well as the relatively quiet operation. I like that this generator works on all appliances and that it’s compact enough to fit almost anywhere in your travel trailer. Because this unit doesn’t have a ton of watts to work with, you need to be careful when determining your power consumption. Also, I don’t like that this model can’t be chained to other generators to increase the wattage, so keep that in mind as well. For some travel trailers, only having a couple thousand watts may be enough. However, if you’re looking for something with a bit more power and reliability, then this model from Westinghouse may be better suited for your travels. Let’s see how it stacks up compared to the others. One thing that I haven’t really discussed yet is the size of your fuel tank. For the most part, generators can only take about two gallons or less, but that means that you can use them for about 6-10 hours, depending on how much power you need. For maximum usage, I recommend only drawing about 25-30% of the total power offered by the generator. So, if it produces 3000 watts, then you should just be utilizing 900 of them at any given time if possible. With four gallons in this tank, the generator can run for up to 18 hours (at 25%), making it much better for boondocking than some of the other models on this list. Another thing about generators for your travel trailer is that you’ll be keeping them outside when they’re in use. Not only will the noise prohibit them from staying inside the trailer, but the fumes can be toxic as well. Depending on where you are and how well you can cover your generator, being outside can be dangerous. Thankfully, this model has sealed outlets so that rain and other debris won’t get caught in them, potentially causing damage. As I mentioned, you may need more power for your appliances, so having something as rugged and high-powered as this machine might be just the ticket. With a running output of 3600 watts, you can use this unit for almost anything inside your travel trailer. When it comes to raw power, this is one of the better options out there. I like the larger tank that lasts longer, as well as the rugged build of the generator itself. Unfortunately, if something does go wrong with this machine, you may not have much luck contacting the manufacturer. Not only that, but many service shops don’t have parts for Westinghouse, so you might have to wait a while before it can be repaired. Otherwise, this is an excellent choice. Because we’re talking about travel trailers with this list, you may not need a massive and super-powerful generator. Assuming that you only have a few electronics inside your mobile home, a compact model like this one from Wen may be more than enough. Let’s see what it can do. One issue that many people have with generators is that they can be annoyingly loud. For the most part, high-powered models will make their presence known, particularly if you keep them running all of the time. Fortunately, if you’re worried about having a lot of noise pollution, this particular unit is designed to be quieter than most, with a decibel range of about 51. This is lower than most conversations, so you can use it without it being too distracting. As long as you’re not operating high-powered devices like a heater or air conditioner, this generator works well with most other small appliances, particularly with sensitive electronics like laptops. To save even more fuel and reduce your costs, this generator has an eco mode, which means that it will automatically adjust its output to meet demand, rather than giving you a bunch of watts that you don’t need. One element I briefly mentioned in the review above was the ability to chain generators together to draw more power. Since this particular model is relatively low in wattage, this capability may be necessary. All you have to do is connect multiple units together, and you can double or triple your electric output. However, keep in mind that while this generator is compact, bringing multiple versions along for the ride can limit your storage space substantially. As long as you’re not trying to power appliances that will draw a lot of electricity, this is the perfect compact generator. I like the eco-mode, as well as the quiet operation and the fact that you can chain multiple units together. With only 1600 watts available while the generator is running, you are much more limited in what you can use while it’s operational. Also, some of the components are not as rugged as other generators, so it can break down with heavy usage. Although gas is the primary fuel source for generators, it’s not the only option out there. So, if you’re thinking about using propane from time to time, you may decide that this dual-fuel model from Duromax is the best option. Let’s see what it can do. When it comes to power output, this is by far the most potent unit we’ve seen so far. With a max wattage of over 4500 and a continuous output of 3850, you shouldn’t have any problems with powering various appliances inside your travel trailer. The other benefit of having such a high-powered motor is that it’s built more solidly than some of the other lighter units, and it’s made for continuous operation, not infrequent usage. One of the most intriguing features of this or any generator is the fact that it can run on both propane and gasoline. Both fuels have their benefits, so let’s do a quick breakdown. Propane - can last longer in between uses (won’t expire). It burns slower, so you can use the generator for more hours. Propane doesn’t generate as much power, however, and refilling the tank can be trickier. Gas - easy to find and fill the generator whenever necessary. Generates more electricity, and it’s usually more stable. However, gas burns faster, so you only get a few hours of use, rather than a whole day. If you’re debating about the type of fuel to use with your generator, this is probably going to be the best option from this list. I also like the high energy output, as well as the rugged and heavy-duty construction. This is a massive generator that weighs more than 100 pounds. Although the wheels help with its portability, it can be a pain to get on and off of your trailer. Also, switching back and forth between fuels can be complicated, so I recommend sticking with one or the other while traveling. Our final generator is another compact model, so if you don’t have very many appliances inside your travel trailer, you may prefer using something like this, rather than a bulky, extra-loud model. One of the better features of this machine is the fact that it shows you how much power you’re using at any given time. This kind of information will help you understand not only your energy needs but whether you need to buy another generator and chain them together. Although most of the time you will plug your RV into the generator directly, you can sometimes use it as an outlet for your electronics instead. If that is the case (thanks to the compact and lightweight design), you have four of them on the front of this unit, making it even more convenient. When it comes to small inverter generators, this one is more than serviceable, assuming that your power needs are relatively minimal. I like the LED screen, and its energy output is better than other models in its class. This generator is not built for continuous use, so if you plan on boondocking a lot, I don’t recommend this unit. 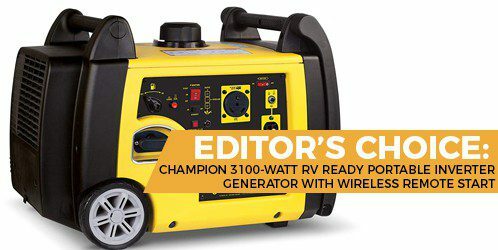 When it comes to the best generator for travel trailers, I would have to say that the model that combines all of the best features, including noise, power output, and convenience, is the Champion Generator. I appreciate that this model provides sufficient power for most appliances, as well as the fact that it’s both reliable and easy to use. Although it’s not the most capable unit on this list, it will work well in most travel trailers and will stay in good condition for longer, which is why it’s my top pick.